Hi again. This time is a lil more frequent since it's like another post within 1 week time. Errrrmmmm.... let's go back and talk about 28th March 2009. Did you switch off your light? 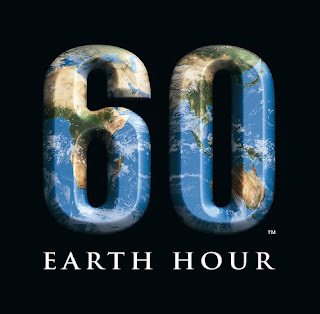 Earth Hour is a simple act of shutting off your light, casting your vote against global warming. Many of you might ask, "How can switching off light help?". This act simply proves your concern to the deteriorating state of our mother Earth and is gladly to give your hands to help fight against global warming. Shutting off a few lights might not help much in the sense of electric saved but consider the impact it gave the world when people unite and give what they can to help reduce such deterioration. With such event, there will be some people who might not know much, pak cik (uncles) and mak cik (aunties) asking "Kenapa nak tutup lampu? (Why switching off the light?)". It is then they know, there is such threat as global warming. See the impact, if you don't... go do an eye check-up for the love of god. Although this is the 1st time Malaysia involved in Earth Hour, it clearly proves "Malaysia Boleh". In support of such an act the people of Malaysia come together, united as one and answered the call for help from our mother Earth. KLCC switched off their light, KL Tower switched off their light, Sunway switched off their light, Pavilion KL switched off their light and I believe many more had switched off their light in support of Earth Hour. Oh I forgot, even my family switched off our house light. As a supporter of Earth Hour, I'm very happy to see people around the world joining hands disregarding the barrier in languages and all. It's an effort to save our world. This crying Earth is weeping shores? Thanks for reading my long post and I hope you will support events which carry a similar objective as Earth Hour.